This is my first try of Tunisian crochet and I love it! 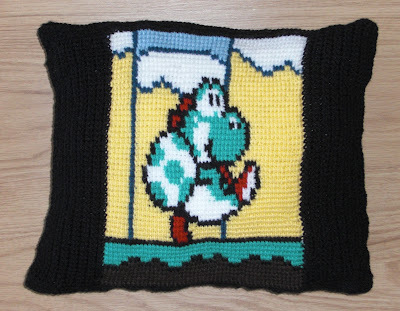 Made a very cute Yoshi cushion. First I had some trouble with the color changes, but with the help from Gege crochet's you-tube clip it turned out great! Created a 50px x 50px image with the help of a sprite database. However I couldn't find any tunisian hooks, so I made one myself from a normal knitting needle. Needed some tweaking, but now it's working great!